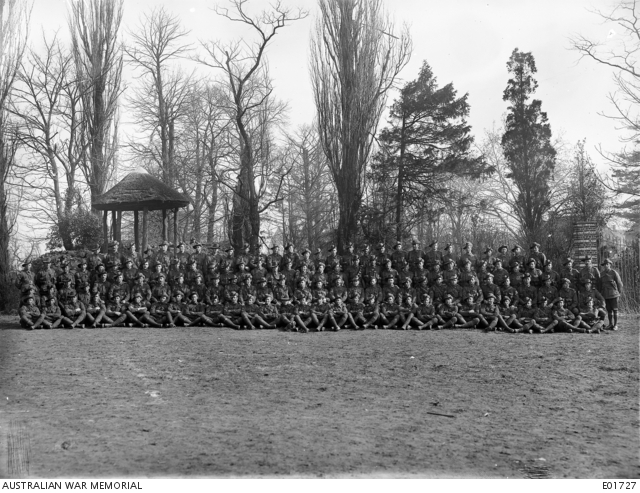 Group portrait of the NCOs of the 13th Battalion. Left to right, back row: 1989 Corporal (Cpl) J. Mitchell; 174 Cpl L. Horne; 5337 Sergeant (Sgt) F. Brant MM; 5717 Cpl W. McDonald (died of wounds 20 September 1918); 4850 Cpl C. W. J. Mann (killed in action 5 July 1918); 4628 Cpl S. R. Brown; 825 Cpl A. Beness MM; 6546 Cpl J. A. Kennedy; 6478 Cpl J. Bales; 6501 Cpl J. H. Duncan MM; 6811 Cpl R. H. W. Stuart MM; 2042 Cpl H. G. Starr; 2791 Cpl W. R. Bradley; 3509 Cpl J. A. Watt MM; 2434 Lance Corporal (LCpl) J. H. Richards; 2421 Cpl A. W. Cima MM; 784 Sgt R. E. Sullivan MM and Bar; 6087 Cpl G. S. McKenzie; 110 Cpl A. Walker; 367 Cpl C. V. Carr (died of wounds 12 August 1918); 2580 Acting Corporal Stephen Darren Jarrett; 2790 Cpl J. V. Bice MM; 1360 Cpl A. Merrilees; 2089 Cpl P. De Mestre; 3975 Cpl E. Webb MM (killed in action 9 August 1918); 3876 Sgt R. Pearson; 6959 Cpl J. E. Burrell; 7063 Cpl M. J. Roach. Third row: 6594 Sgt G. Sexton VC DCM; 7199 LCpl J. P. Baillie; 3150 Cpl F. H. West; 6537 Cpl W S Hewett MM (killed in action 7 August 1918); 3850 Cpl F. E. Massey DCM MM; 22 Cpl G. Davis; 3255 Cpl E H G Bolus (killed in action 5 July 1918); 6019 LCpl A. N. Fitch; 6612 Cpl S. Wright; 6992 Sgt C. Goodwin MM; 1286 Sgt E. K. Lane MM; 4291 Cpl T. F. Ryan; 2140 Cpl E. G. Curley (killed in action 8 August 1918); 1389 Company Sergeant Major (CSM) W. Oswald MM DCM; 4298 Sgt A. Settle MM; 2949 CSM M. J. Tague MM; 953 Cpl W. F. Hughes DCM; 1663 Sgt H. E. Miller; 4212 Sgt A. Hutchinson; 4250 Sgt J. McDonald; 188 Sgt T. W. Keeler MM; 529 Sgt J. E. Langham; 3439 Cpl S. W. Purcell MM; 2885 Sgt A. Cormack MM and Bar (killed in action 1 April 1918); 210 Sgt W. Pearse; 5380 Cpl R. G. W. Hill MSM; 2827 Cpl W. F. Geikie; 327 Cpl F. A. Steeter; 1611 Sgt P. S. Stevens; 1124 Cpl R. Chapman DCM (killed in action 14 May 1918); 5741 Cpl A. Oakes; 1677 LCpl R. Bertholli; 3312 Cpl H. F. Evans (killed in action 29 April 1918); 7043 Cpl A. L. McGinnis; 7059 LCpl E. Rawdon DCM; 5176 Cpl H. W. Smith. Second row: 6557 LCpl L. T. Lindon; 5713 Sgt J. Lihou DCM MM (killed in action 18 September 1918); 3876 LCpl R. Pearson; 7621 LCpl S. Cush Medical Medal; 2407 Sgt A. Lowe MSM; 1099 Sgt E. Hall MM; 2139 Regimental Sergeant Major (RSM) L. V. Cox MM; 1557 Sgt H. Sparrow; 666 Sgt H. Pattison MM; 2897 Sgt T. Piddington; 3572 Sgt T. J. Jefferson; 2952 Company Sergeant Major (CSM) J. McDonald; 3552 Sgt W. E. Noble; 952 Sgt W. Jackson; 2609 RSM W. J. Harper DCM (killed in action 27 March 1918); 7270 CSM E. Harradine MM; 1718 CSM J. Buckle; 3085 CSM J. Meek DCM (killed in action 17 August 1918); 3432 Sgt L. P. Pisto; 569 Sgt G. W. Hickling MM; 3012 Sgt T. Baxter DCM (killed in action 11 August 1918); 1376A Sgt W. Merriel MM (killed in action 2 July 1918); 885 Sgt C. Wearne; 5170 Sgt E. Robertson (killed in action); 137 Sgt L. Canning MM 885 Sgt P. McKabe MM; 387 Sgt J. Grady; 32 Sgt W. Franklin; 4269 Sgt H. Pickup; 2065 Sgt E. Strumey MSM; 2923 LCpl S. Rutter; 1194 Cpl W. L. Blaw MM. Front row: 3403 Cpl H. G. McIlveen; 1185 LCpl C. D. Eason MM; 6026 LCpl J. J. Gosper (killed in action 9 August 1918); 1613 LCpl A. P. Lundie (killed in action 9 September 1918); 1210 LCpl J. D. McMillan (killed in action 22 March 1918); 2685 Sgt H. E. Skipper; 807 LCpl K. J. B. McDonald; 3413 Sgt A. L. McLaren; 6986 Sgt W. Bronen; 2003 Sgt A. C. Parry; 6088 LCpl W. D. McDiarmid (killed in action 8 August 1918); 2315 LCpl T. K. Foggan; 7368 LCpl W. R. B. Edgar; 2925 Cpl A. B. Williams MM; 3011 LCpl J. Batchelder; 5994 LCpl H. Cananough; 3772 LCpl R. Gleeson; 5983 Cpl S. P. Brace; 2699 Sgt E. W. C. Pryce; 3894 Cpl E. T. Rice; 7300 CSM J. H. Prowse; 2419 Sgt P. J. Bourke MM; 7110 Cpl A. J. Carter; 7090 LCpl C. G. Thompson (killed in action 6 April 1918); 7048 LCpl I M McIver (died of wounds 31 March 1918); 1334 Cpl H. C. Dickson MM; 3883 Cpl W. L. Phillips DCM MM; 1726 Sgt F. Forbes MM and Bar; 1956 Cpl M. Holt (killed in action 5 July 1918); 5238 LCpl H. L. Witts.